The desert biome includes several formation classes that are transitional from grassland and savanna biomes into vegetation of the arid desert. 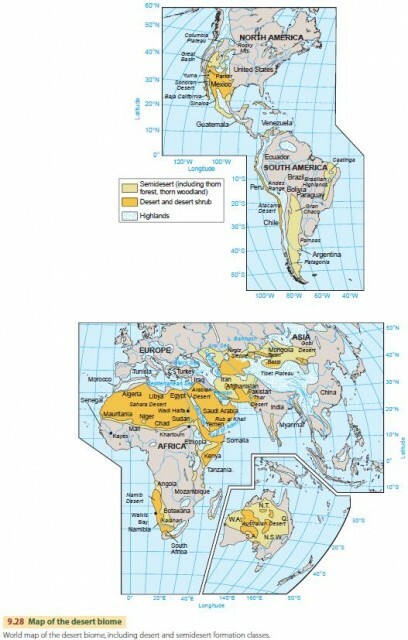 Our map of the desert biome (Figure 9.28) recognizes two basic formation classes: semidesert and dry desert. Semidesert is a transitional formation class found in a wide latitude range—from the tropical zone to the midlatitude zone. It is identified primarily with the arid subtypes of all three dry climates. Semidesert consists primarily of sparse xerophytic shrubs. One example is the sagebrush vegetation of the middle and southern Rocky Mountain region and Colorado Plateau. In recent times, overgrazing and trampling by livestock have helped semidesert shrub vegetation expand widely into areas of the western United States that used to be steppe grasslands. Thorntree semidesert of the tropical zone is made up of xerophytic trees and shrubs that are adapted to a climate with a very long, hot dry season and only a very brief, but intense, rainy season. We find these conditions in the semiarid and arid subtypes of the dry tropical and dry subtropical climates. The thorny trees and shrubs are known locally as thorn forest, thornbush, or thornwoods. In some places, cactus plants are abundant. Dry desert is a formation class of plants that are widely dispersed over the ground. It consists of small, hard-leaved, or spiny shrubs, succulent plants (such as cactus), or hard grasses. Many species of small annual plants only appear after rare and heavy downpours. In fact, many of the areas mapped as desert vegetation have no plant cover at all because the surface consists of shifting dune sands or sterile salt flats. Desert plants around the world look very different from each other. In the Mojave and Sonoran deserts of the southwestern United States, plants are often large, giving the appearance of a woodland. Desert animals, like the plants, are typically adapted to the dry conditions of the desert. Important herbivores in American deserts include kangaroo rats, jackrabbits, and grasshopper mice. Insects are abundant, as are insect-eating bats and birds such as the cactus wren. Reptiles, especially lizards, are also common. Arctic tundra is a formation class of the tundra biome, with a tundra climate. In this climate, plants grow during the brief summer of long days and short (or absent) nights. At this time of year, air temperatures rise above freezing, and a shallow surface layer of ground ice thaws. The permafrost beneath, however, remains frozen, keeping the meltwater at the surface. These conditions create a marshy environment for a short time over wide areas. Because plant remains decay very slowly within the cold meltwater, layers of organic matter build up in the marshy ground. Frost action in the soil fractures and breaks large roots, keeping tundra plants small. In winter, wind-driven snow and extreme cold also injure plant parts that project above the snow. Tundra vegetation is also found at high elevations, above the limit of tree growth and below the vegetation-free zone of bare rock and perpetual snow. This alpine tundra resembles arctic tundra in many physical respects. Although only a few plant and animal species are suited to the tundra, they are often represented by a large number of individuals. The food web of the tundra ecosystem is simple and direct. The important producer is reindeer moss, the lichen Cladonia rangifera. Caribou, reindeer, lemmings, ptarmigan (arctic grouse), and snowshoe rabbits all graze on this lichen. Foxes, wolves, and lynxes prey on those animals, although they may all feed directly on plants as well. During the summer, the abundant insects help support the migratory waterfowl populations.